This article is about Saint Brendan of Clonfert. For other uses, see Brendan (disambiguation). Saint Brendan of Clonfert (c. AD 484 – c. 577) (Irish: Naomh Bréanainn or Naomh Breandán; Latin: Brendanus; Icelandic: (heilagur) Brandanus), also referred to as "Brendan moccu Altae", called "the Navigator", "the Voyager", "the Anchorite", and "the Bold", is one of the early Irish monastic saints and one of the Twelve Apostles of Ireland. He is primarily renowned for his legendary quest to the "Isle of the Blessed", also denominated "Saint Brendan's Island". The Navigatio Sancti Brendani Abbatis ("Voyage of Saint Brendan") can be described as an immram, i. e., Irish navigational narrative. There is very little secure information concerning Brendan's life, although at least the approximate dates of his birth and death, and accounts of some events in his life, are found in Irish annals and genealogies. The earliest mention of Brendan is in the Vita Sancti Columbae ("Life of Saint Columba") of Adamnan written between AD 679 and 704. The earliest mention of him as a seafarer appears in the Martyrology of Tallaght of the ninth century. The principal works regarding the saint and his legend are a "Life of Brendan" in several Latin (Vita Brendani) and Irish versions (Betha Brenainn) and the better known Navigatio Sancti Brendani Abbatis ("Voyage of Saint Brendan the Abbot"). Unfortunately, the versions of the Vita and the Navigatio provide little reliable information of his life and travels; they do, however, attest to the development of devotion to him in the centuries after his death. An additional problem is that the precise relationship between the Vita and the Navigatio traditions is uncertain. The date when the Vita tradition began is uncertain. The earliest surviving copies are no earlier than the end of the twelfth century, but scholars suggest that a version of the Vita was composed before AD 1000. The Navigatio was probably written earlier than the Vita, perhaps in the second half of the eighth century. Saint Aengus the Culdee, in his Litany, composed in the end of the eighth century, invoked "the sixty who accompanied St. Brendan in his quest for the Land of Promise". Any attempt to reconstruct the facts of the life of Saint Brendan or to understand the nature of his legend must be based principally on Irish annals and genealogies and on the various versions of the Vita Brendani. Brendan was born in AD 484 in Tralee, in County Kerry, in the province of Munster, in the south-west of Ireland. He was born among the Altraige, a tribe originally centred around Tralee Bay, to parents called Finnlug and Cara. Tradition has it that he was born in the Kilfenora/Fenit area on the North side of the bay. He was baptised at Tubrid, near Ardfert by Saint Erc, and was originally to be called "Mobhí" but signs and portents attending his birth and baptism led to him being christened 'Broen-finn' or 'fair-drop'. For five years he was educated under Saint Ita, "the Brigid of Munster". When he was six he was sent to Saint Jarlath's monastery school at Tuam to further his education. Brendan is one of the "Twelve Apostles of Ireland", one of those said to have been tutored by the great teacher, Finnian of Clonard. At the age of twenty-six, Brendan was ordained a Catholic priest by Saint Erc. Afterwards, he founded a number of monasteries. Brendan’s first voyage took him to the Aran Islands, where he founded a monastery. He also visited Hinba (Argyll), an island off of Scotland where he is said to have met Columcille (Saint Columba). On the same voyage he traveled to Wales and finally to Brittany, on the northern coast of France. Between AD 512 and 530 Brendan built monastic cells at Ardfert, and Shanakeel (Seana Cill, usually translated as the "Old Church"), at the foot of Mount Brandon. From there he is supposed to have embarked on his famous voyage of 7 years for Paradise. The old Irish calendars assigned a feast for the "egressio familiae Sancti Brendani". Saint Brendan is primarily renowned for his legendary journey to the Isle of the Blessed as described in the Navigatio Sancti Brendani Abbatis (Voyage of Saint Brendan the Abbot) of the ninth century. Many versions exist that narrate how he set out on the Atlantic Ocean with 16 monks (although other versions record 14 plus 3 unbelievers who joined in the last minute) to search for the Garden of Eden. One of these companions is said to have been Saint Malo, the namesake of Saint-Malo. If it happened, this would have occurred between AD 512–530, before his travel to the island of Great Britain. On his trip, Brendan is supposed to have seen Saint Brendan's Island, a blessed island covered with vegetation. He also encountered a sea monster, an adventure he shared with his contemporary Saint Columba. The most commonly illustrated adventure is his landing on an island which turned out to be a giant sea monster named "Jasconius" or "Jascon". The earliest extant version of the Navigatio Sancti Brendani Abbatis (Voyage of Saint Brendan the Abbot) was recorded c. AD 900. There are over 100 manuscripts of the narrative throughout Europe and many translations. The Navigatio is plainly a Christian narrative, but also narrates natural phenomena and fantastical events and places, which appealed to a broad audience. The Navigatio contains many parallels and inter-textual references to Bran and the Voyage of Máel Dúin. On the Kerry coast, Brendan built a currach-like boat of wattle, covered it with hides tanned in oak bark and softened with butter, and set up a mast and a sail. He and a small group of monks fasted for 40 days, and after a prayer on the shore, embarked in the name of the Most Holy Trinity. The narrative is characterized by much literary license, e. g., it refers to Hell where “great demons threw down lumps of fiery slag from an island with rivers of gold fire” and also to “great crystal pillars.” Many speculate that these are references to volcanic activity around Iceland and to icebergs. Saint Barrid tells of his visit to the Island of Paradise, which prompts Brendan to go in search of the isle. Brendan assembles 14 monks to accompany him. They fast at three-day intervals for 40 days, and visit Saint Enda for 3 days and 3 nights. 3 latecomers join the group. They interfere with Brendan's sacred numbers. They find an island with a dog, mysterious hospitality (no people, but food left out), and an Ethiopian devil. One latecomer admits to stealing from the mysterious island; Brendan exorcises the Ethiopian devil from the latecomer; and the latecomer dies and is buried. They find an island with a boy who brings them bread and water. They find an island of sheep, eat some, and stay for Holy Week (before Easter). They find the island of Jasconius, celebrate Easter Mass, and hunt whales and fish. They find an island that is the "Paradise of Birds", and the birds sing psalms and praise God. They find the island of the monks of Ailbe, who have magic loaves, do not age, and maintain complete silence. They celebrate Christmas. A long voyage after Lent. They find an island with a well, and drinking the water puts them to sleep for 1, 2, or 3 days contingent on the number of cups each man drank. They find a "coagulated" sea. They return to the islands of sheep, Jasconius, and the Paradise of Birds. A bird prophesies that the men must continue this year-long cycle for 7 years before they will be holy enough to reach the Island of Paradise. A sea creature approaches the boat, but God shifts the sea to protect the men. Another sea creature comes, chops the first into three pieces, and leaves. The men eat the dead sea creature. They find an island of 3 choirs of anchorites (monks), who give them fruit, and the second latecomer remains while the others leave. They find an island of grapes, on which they stay for 40 days. They find a gryphon and a bird battle. The gryphon dies. Journey to the monastery at Ailbe again for Christmas. The sea is clear, and many threatening fish circle their boat, but God protects them. They find an island, but when they light a fire, the island sinks; they realize that it is actually a whale. They pass a "silver pillar wrapped in a net" in the sea. They pass an island of blacksmiths, who throw slag at them. They find a volcano, and demons take the third latecomer down to Hell. They find Judas Iscariot sitting unhappily on a cold, wet rock in the sea, and learn that this is his respite from Hell for Sundays and feast days. Brendan protects Judas from the demons of Hell for one night. They find an island where Paul the Hermit has lived a perfect monastic life for 60 years. He wears nothing but hair and is fed by an otter. They return to the islands of sheep, Jasconius, and the Paradise of Birds. They find the Promised Land of the Saints. They return home, and Brendan dies. The Navigatio fits in with a then-popular literary genre, peculiar to Ireland, denominated an immram. Irish immrama flourished during the seventh and eighth centuries. Typically, an immram is a tale that describes the hero's series of seafaring adventures. Some of these immrams involved the search for, and visits to, Tir na nOg, an island far to the west, beyond the edges of the world map. There appear to be similarities with The Voyage of Bran written much earlier. In the Navigatio, this style of storytelling meshed with a religious ascetic tradition in which Irish monks travel alone in boats, the same way their desert brothers isolated themselves in caves. Brendan's voyages were one of the most remarkable and enduring of European legends. With many of the facts of Brendan's journeys coming from the Navigatio, it has been difficult for scholars to distinguish fact and folklore. The narrative of Brendan's voyage, developed during this time, shares some characteristics with immram. Like an immram, the Navigatio tells the story of Brendan, who, with some companion monks, sets out to find the terra repromissionis sanctorum, ("Promised Land of the Saints"), i. e., the Earthly Paradise. Scholars debate whether the Navigatio influenced the Voyage of Mael Duin or vice versa. Jude Mackley suggests that an early Navigatio influenced an equally early Mael Duin and that inter-borrowing continued as the traditions developed. The Navigatio adapts the immram traditions to a Christian context. A principal similarity between Mael Duin and the Navigatio is the introduction in both of 3 additional passengers. Mael Duin is joined by his foster brothers, and Brendan by 3 additional monks. Both additions upset the equilibrium of the voyages, and only when the additional persons are no longer on board can each voyage be completed. One of the earliest extant written versions of Brendan's legend is the Dutch De Reis van Sinte Brandaen (Mediaeval Dutch for The Voyage of Saint Brendan) of the twelfth century. Scholars believe it is derived from a now lost Middle High German text combined with Gaelic elements from Ireland and that it combines Christian and fairy tale elements. De Reis van Sinte Brandaen describes "Brandaen", a monk from Galway, and his voyage around the world for 9 years. The journey began as a punishment by an angel who saw that Brendan did not believe in the truth of a book of the miracles of creation and saw Brandaen throw it into a fire. The angel tells him that truth has been destroyed. On his journeys Brandaen encounters the wonders and horrors of the world, such as Judas Iscariot frozen on one side and burning on the other; people with swine heads, dog legs, and wolf teeth carrying bows and arrows; and an enormous fish that encircles Brandaen's ship by holding its tail in its mouth. The English poem the Life of Saint Brandan is a later derivation from the Dutch version. While the narrative is often assumed to be a religious allegory, there has been considerable discussion as to whether the legends are based on fact. There have been many interpretations of the possible geographical location of Saint Brendan's Island. Various pre-Columbian sea charts indicated it everywhere from the southern part of Ireland to the Canary Islands, Faroes, or Azores; to the island of Madeira; to a point 60 degrees west of the first meridian and very near the equator. Belief in the existence of the island was almost completely abandoned when a new theory arose that the Irish were the first Europeans to encounter the Americas. There is no reliable evidence to indicate that Brendan ever reached Greenland or the Americas. The Saint Brendan Society celebrates the belief that Brendan was the first European to reach North America. Tim Severin demonstrated that it is possible for a leather-clad boat such as the one described in the Navigatio to reach North America. Severin's film The Brendan Voyage of 1978, which documented his team's feat, inspired the Irish composer Shaun Davey to write his orchestral suite "The Brendan Voyage". The Navigatio was known widely in Europe throughout the Middle Ages. Maps of Christopher Columbus’ time often included an island denominated Saint Brendan’s Isle that was placed in the western Atlantic Ocean. Paul Chapman argues that Christopher Columbus learned from the Navigatio that the currents and winds would favor westbound travel by a southerly route from the Canary Islands, and eastbound on the return trip by a more northerly route, and hence followed this itinerary on all of his voyages. Brendan travelled to Wales and the holy island of Iona, off the west coast of Scotland; returning to Ireland, he founded a monastery in Annaghdown, where he spent the rest of his life. He also founded a convent at Annaghdown for his sister Briga. Having established the bishopric of Ardfert, Brendan proceeded to Thomond, and founded a monastery at Inis-da-druim (presently Coney Island), in the present parish of Killadysert, County Clare, c. AD 550. He then journeyed to Wales and studied under Saint Gildas at Llancarfan, and thence to Iona, for he is said to have left traces of his apostolic zeal at Kil-brandon (near Oban) and Kil-brennan Sound. After a mission of 3 years in Britain he returned to Ireland, and evangelized further in various parts of Leinster, especially at Dysart (presently in County Kilkenny), Killiney (Tubberboe), and Brandon Hill. He established churches at Inchiquin (presently in County Galway) and Inishglora (presently in County Mayo), and founded Clonfert in Galway c. AD 557. He died c. AD 577 in Annaghdown, while visiting his sister Briga. Fearing that after his death his devotees might take his remains as relics, Brendan had previously arranged to have his body secretly returned to the monastery he founded in Clonfert, concealed in a luggage cart. He was interred in Clonfert Cathedral. Brendan was recognised as a saint by the Church. His feast day is celebrated on 16 May. As the legend of the seven years voyage spread, crowds of pilgrims and students flocked to Ardfert. Religious houses were formed at Gallerus, Kilmalchedor, Brandon Hill, and the Blasket Islands, to meet the wants of those who came for spiritual guidance from Saint Brendan. Saint Brendan is the Patron Saint of sailors and travellers. At the United States Naval Academy in Annapolis, Maryland, a large stained glass window commemorates Brendan's achievements. At Fenit Harbour, Tralee, a substantial bronze sculpture by Tighe O'Donoghue/Ross was erected to honour the memory of Brendan. The project, including a Heritage Park and the Slí Bhreanainn (the Brendan way) was headed by Fr. Gearóid Ó Donnchadha and completed through the work of the St. Brendan Committee. Statue of Brendan at Fenit Harbour. Brendan the Navigator or Brénainn moccu Alti as he is often known in the medieval Irish tradition is the patron Saint of two Irish Dioceses, Kerry and Clonfert. He is also a patron saint of boatmen, mariners, travelers, elderly adventurers, and whales, and also of portaging canoes. St Brendan's activities as a churchman, however, were developed in Western Ireland, where his most important foundations are found, i.e. Ardfert (Co. Kerry), Inishdadroum (Co. Clare), Annaghdown (Co. Galway), and Clonfert (Co. Galway). 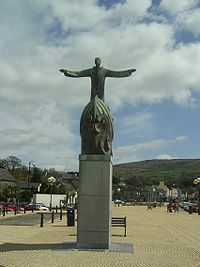 His name is perpetuated in numerous place names and landmarks along the Irish coast (e.g. Brandon Hill, Brandon Point, Mount Brendan, Brandon Well, Brandon Bay, Brandon Head). Saint Brendan's most celebrated foundation was Clonfert Cathedral, in the year 563, over which he appointed St Moinenn as Prior and Head Master. St Brendan was interred in Clonfert. The group of ecclesiastical remains at Ardfert is one of the most interesting and instructive now existing in Ireland. The ruins of the ancient Cathedral of St Brendan, and of its annexed chantries and detached chapels, form a very complete reliquary of Irish ecclesiastical architecture, in its various orders and ages, from the plain but solid Danhliag of the seventh or eighth century to some late and most ornate examples of medieval Gothic. The cathedral, as it now stands, or rather as it stood before it was finally dismantled in A.D. 1641. Australian novelist Patrick Holland re-imagines the Brendan voyage in his 2014 novel Navigatio. The Brendan Voyage is an orchestral suite for Uilleann pipes, written by Irish composer Shaun Davey recorded in 1980 featuring Liam O'Flynn. It is based on Tim Severin's book of the same name. Novelist Frederick Buechner retold the story of Brendan's travels in his 1987 novel Brendan. The Celtic band Iona made an entire recording inspired by the voyage of Saint Brendan called Beyond These Shores, now available as part of the recording The River Flows. Singer songwriter Sarana VerLin wrote an instrumental song titled "St Brendan's Reel" that appears on several albums including "Amadon Crest". In the 2005 film Beowulf & Grendel, a travelling monk named Brendan the Celt sails to Denmark circa 521 A.D.
J. R. R. Tolkien wrote a poem called "The Voyage of Saint Brendan", included in his time-travel story "The Notion Club Papers", published posthumously (1992) in Sauron Defeated. He also published a version of the poem, titled "Imram", during his lifetime, in 1955. The cream liqueur "Saint Brendan's" is named after him. Tommy Makem sang of the idea that Brendan's Isle of the Blessed was in fact America. His song "Brendan" on the album "Rolling Home" tells the story (explained in detail on the disk sleeve) of how he travelled to Newfoundland, down the coast to Florida, and thence back to Ireland. The Irish rock band The Elders have a song on their album "Racing the Tide" called "Saint Brendan Had a Boat"
Saint Brendan has been adopted by the scuba diving industry as the Patron Saint of Scuba Divers. Irish folk singer Christy Moore had a humorous track called "St. Brendan's Voyage" on his 1985 album Ordinary Man. Ozarks folk singer Jimmy Driftwood wrote a humorous song about the voyage of St. Brendan called "St. Brendan's Fair Isle". Novelist Patricia Kennealy-Morrison features a fictional Brendan in her book "The Deers Cry", a story with a science fiction twist. In this book, Brendan is a pagan who decides to leave Earth for another planet because of his dislike for Christianity. 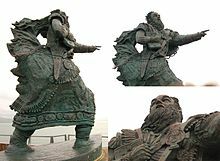 At the climatic scene of Robert E. Howard's story The Cairn on the Headland, the protagonist uses a hallowed Cross made by Saint Brendan in order to banish the Norse god Odin, who was about to come back to life and destroy modern Dublin (). Matthew Arnold's poem "Saint Brandan" tells of the meeting with Judas on the iceberg. Alison Brown, an American banjo player, guitarist, composer, and producer, has a song called “The Wonderful Sea Voyage (of Holy Saint Brendan) on her “Alison Brown Quartet” CD. In Part 2 of John Crowley's 2017 novel Ka: Dar Oakley in the Ruin of Ymr, the crow Dar Oakley escorts a group of brothers and fisherman across the water. One of the brothers is revealed to be Saint Brendan. In the Sicilian town of Bronte there is a church dedicated to Saint Brendan, whose name in the local dialect is "San Brandanu". Since 1574, the "Chiesa di San Blandano" ("Church of Saint Brendan") replaced a chapel with such name that existed previously in the same location. The reasons for dedicating a church to Saint Brendan are still unknown and probably untraceable. The Normans and the many settlers that followed the Norman invasion brought into Sicily the tradition of Saint Brendan; there are very old papers of the 13th century written in Sicily that refer to him; in 1799 the countryside surrounding Brontë became the British "Duchy of Horatio Nelson". The town of Drogheda is twinned with Bronte. ^ (in Greek) Ὁ Ὅσιος Βρενδανὸς ὁ Ἀναχωρητής. ΜΕΓΑΣ ΣΥΝΑΞΑΡΙΣΤΗΣ. ^ a b c "St. Brendan the Navigator", Orthodox Outlet for Dogmatic Enquiries. ^ John D. Anderson, "The Navigatio Brendani: A Medieval Best Seller", The Classical Journal, 83, 4 (1988): p. 315-22. ^ Glyn Burgess, The Voyage of St Brendan, University of Exeter Press, United Kingdom, 2002. ^ a b c "Saint Brendan the Navigator", A Little Book of Celtic Saints. ^ # John D. Anderson, The Classical Journal, Vol. 83, No. 4 (Apr. – May 1988), pp. 315-22. ^ a b c Jude S. Mackley, "The Legend of St. Brendan", Brill, 2008 ISBN 9789004166622. ^ T. J. Oleson, "Brendan, Saint", Dictionary of Canadian Biography, Vol. 1, University of Toronto/Université Laval, 2003. ^ Timothy Severin, "The Voyage of the 'Brendan'", National Geographic Magazine, 152: 6 (December 1977), p. 768-97. ^ Tim Severin, The Brendan Voyage: A Leather Boat Tracks the Discovery of America by the Irish Sailor Saints, McGraw-Hill Book Company, 1978, ISBN 0-07-056335-7. ^ Tim Severin, "Atlantic Navigators: The Brendan Voyage", 2005 presentation at Gresham College, video posted on National Geographic Voices by Andrew Howley May 16, 2013. ^ Robert Reily, Irish Saints, p. 37, Wing Books, New Jersey, 1964, ISBN 0-517-36833-1. ^ Howley, Andrew. "Did St. Brendan Reach North America 500 Years Before the Vikings? ", National Geographic Voices, May 16, 2013. ^ Paul H. Chapman, The Man who Led Columbus to America, Atlanta, Georgia, Judson Press, 1973. ^ "Corrandulla / Annaghdown". County Galway Guide. Retrieved 28 March 2009. ^ Selmer, Carl. Navigatio Sancti Brendani Abbatis. Indiana: University of Notre Dame Press, 1959. ^ O’Donoghue, Denis. Brendaniana. Dublin, Ireland: Browne & Nolan, 1893. Meijer, Reinder. Literature of the Low Countries: A Short History of Dutch Literature in the Netherlands and Belgium. New York: Twayne Publishers, Inc., 1971.
trans. John O‟Meara and Jonathan Wooding, in The Voyage of Saint Brendan: Representative Versions of the Legend in English Translation, ed. W.R.J. Barron and Glyn S. Burgess (Exeter, 2002). ed. and tr. G. Orlandi - R.E. Guglielmetti, Navigatio sancti Brendani. Alla scoperta dei segreti meravigliosi del mondo (Firenze, 2014). ed. and tr. Whitley Stokes, Lives of Saints from the Book of Lismore. Anecdota Oxoniensia, Mediaeval and Modern Series 5. Oxford, 1890. pp. 99–116, 247–61. Based on the Book of Lismore copy. ed. and tr. Denis O’Donoghue, Brendaniana. St Brendan the Voyager in Story and Legend. Dublin, 1893. Partial edition and translation, based on the Book of Lismore as well as copies in Paris BNF celtique et basque 1 and BL Egerton 91.
ed. and tr. Charles Plummer, Bethada náem nÉrenn. Lives of the Irish saints. Oxford: Clarendon, 1922. Vol. 1. pp. 44–95; vol. 2, 44–92. Bray, Dorothy, "Allegory in the Navigatio Sancti Brendani", Viator 26 (1995), 1–10. Gardiner, Eileen, Visions of Heaven and Hell Before Dante (New York: Italica Press, 1989), pp. 81–127, provides an English translation of the Latin text of the Voyage of St Brendan. Wooding, Jonathan, The Otherworld Voyage in Early Irish Literature (Dublin, 2000). Murray, K. Sarah-Jane, "The Wave Cry, The Wind Cry," in From Plato to Lancelot (Syracuse University Press, 2008). Wikimedia Commons has media related to Saint Brendan. Wikisource has the text of the 1911 Encyclopædia Britannica article Brendan. Saint Brendan's Island, also known as Saint Brendan's Isle, is a phantom island or mythical island, supposedly situated in the North Atlantic somewhere west of Northern Africa. It is named after Saint Brendan of Clonfert. He and his followers are said to have discovered it while travelling across the ocean and evangelising its islands. It appeared on numerous maps in Christopher Columbus's time, most notably Martin Behaim's Erdapfel of 1492. It is denominated La isla de San Borondón and isla de Samborombón in Spanish. An immram is a class of Old Irish tales concerning a hero's sea journey to the Otherworld. Written in the Christian era and essentially Christian in aspect, they preserve elements of Irish mythology. Saint Iarlaithe mac Loga, also known as Jarlath, was an Irish priest and scholar from Connacht, remembered as the founder of the monastic School of Tuam and of the Archdiocese of Tuam, of which he is the patron saint. No medieval Life for Iarlaithe is extant, but sources for his life and cult include genealogies, martyrologies, the Irish Lives of St Brendan of Clonfert, and a biography compiled by John Colgan in the 17th century. Saint Ailbe, usually known in English as St Elvis, (British/Welsh) Eilfyw or Eilfw, was regarded as the chief 'pre-Patrician' saint of Ireland. He was a bishop, confessor and later saint. Little that can be regarded as reliable is known about Ailbe: in Irish sources from the 8th century he is regarded as the first bishop, and later patron saint of Emly in Munster. Later Welsh sources associate him with Saint David whom he was credited with baptizing and very late sources even give him a local Welsh genealogy making him an Ancient Briton. The Twelve Apostles of Ireland were twelve early Irish monastic saints of the sixth century who studied under St Finian at his famous monastic school Clonard Abbey at Cluain-Eraird, now Clonard in County Meath. Saint Wandregisel was a Frankish courtier, monk, and abbot. According to the tradition of the Physiologus and medieval bestiaries, the aspidochelone is a fabled sea creature, variously described as a large whale or vast sea turtle, and a giant sea monster with huge spines on the ridge of its back. No matter what form it is, it is always described as being huge where it is often mistaken for an island and appears to be rocky with crevices and valleys with trees and greenery and having sand dunes all over it. The name aspidochelone appears to be a compound word combining Greek aspis, and chelone, the turtle. It rises to the surface from the depths of the sea, and entices unwitting sailors with its island appearance to make landfall on its huge shell and then the whale is able to pull them under the ocean, ship and all the people, drowning them. It also emits a sweet smell that lures fish into its trap where it then devours them. In the moralistic allegory of the Physiologus and bestiary tradition, the aspidochelone represents Satan, who deceives those whom he seeks to devour. Padarn was an early 6th century sanctified British Christian abbot-bishop who founded St Padarn's Church in Ceredigion, Wales. The first bishop of Braga and Saint Paternus of Avranches in Normandy appear to be the same person. Padarn built a monastery in Vannes and is considered one of the seven founding saints of Brittany. Padarn's early vita is one of five insular and two Breton saints' lives that mention King Arthur independently of Geoffrey of Monmouth's Historia Regum Britanniae. Saint Brendan of Birr was one of the early Irish monastic saints. He was a monk and later an abbot, of the 6th century. He is known as "St Brendan the Elder" to distinguish him from his contemporary and friend St Brendan the Navigator of Clonfert. He was one of the Twelve Apostles of Ireland, a friend and disciple of Saint Columba. Annaghdown is a parish in County Galway, Ireland. It takes its name from Eanach Dhúin, Irish for "the marsh of the fort". The village lies around Annaghdown Bay, an inlet of Lough Corrib. The parish is situated in the Archdiocese of Tuam and the Diocese of Tuam, Killala and Achonry. Abbotts Cove is a settlement in Newfoundland and Labrador. It is located upon Peckford Island, the largest member of a small chain known as the Wadham Islands or Outer Wadham Group.